I would like to personally welcome you and your family to the 2018-2019 school year. 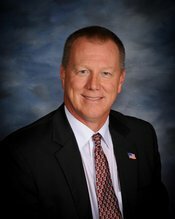 It is my privilege and honor to serve as Superintendent of Nye County School District (NCSD). I continue to have the passion and commitment to serve this organization, as well as the desire to continue to make a difference in Nye County. I have received the honor of Nevada Superintendent of the Year for the 2017-2018 school year. I am very fortunate as a change leader to have a Board of Trustees who have been phenomenal in supporting me in implementing their vision of a high performing district. Currently in my seventh year as Superintendent of Schools, I remain as committed to all NCSD students as I was going into my first year. Together we will continue to move forward with every child in mind. Our goal is to provide excellent instruction to every child, in every classroom, every day. 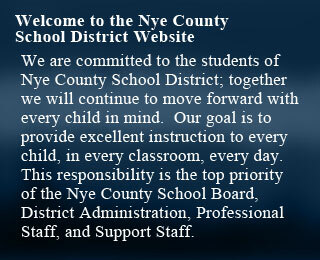 Please visit the NCSD Website: (http://www.nye.k12.nv.us). You will find an abundance of information located there including links to your child’s school and to our Facebook page. NCSD made positive gains across the board on the 2016-2017 Nevada Summative Assessment (SBAC). The percentage of elementary students who earned a proficient score on the English/Language Arts portion of the test increased by 6.07 percentage points compared to the prior year and middle school students gained 2.61 points. For Math, there was a 5.17 percentage point rise in proficient elementary students compared to the previous school year, while there was a rise of 2.31 points for middle school students. Student ACT scores have been steadily climbing up in the district rankings over the past three years. NCSD remains focused on student achievement and the overall education process. The State Edition of Infinite Campus is a district-wide system designed to manage attendance, grades, schedules, assessments and other student information. Parents/legal guardians have on-line access to the Campus Portal, a confidential and secure website to view your child’s progress in school, attendance, lunch balance, etc. Ask for additional information at your child’s school regarding this portal and how to access it. On behalf of Nye County School District, Board of Trustees, the leadership and administrative team, professional staff and support staff, I welcome you to join us in preparing your child for their future. Please do not hesitate to contact us if we can be of assistance to you at any time during the school year. If you would like to volunteer for NCSD, please contact our volunteer office. Masters Degree in Administration and Bachelors Degree in Education. Driven by results, growth and enabling others to work at their highest level. Dedicated to enthusiastic and dynamic leading as a means of creating and nurturing a successful educational environment.